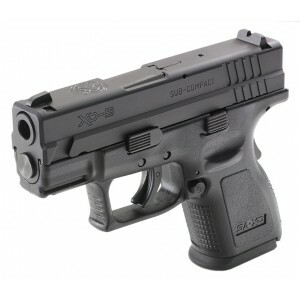 The XD® 3" Sub-Compact from Springfield Armory® is designed to bring you the most in a concealed carry pistol. Its superior ergonomics, reliable performance, and astonishing capacity combine to put more into a concealable pistol than you will find anywhere else. The XD® 3" Sub-Compact has all the same features found in the standard XD® line, but in a smaller package. The barrel is 3" and the frame is a short, compact size that will let the pistol nearly disappear when you carry it. Enjoy 13+1 rounds of 9mm with the included flush-fitting magazines. You'll find everything on the XD® 3" Sub-Compact that make Springfield's XD®'s easy to use and safe to handle. The striker status indicator, loaded chamber indicator, grip safety, Ultra Safety Assurance (USA) Action Trigger System™ and internal firing pin block bring the safety and usability to the XD® 3" Sub-Compact that you're used to with every other XD®. If you're looking for a concealable pistol, but don't want to sacrifice capacity, reach for an XD® 3" Sub-Compact. It's an excellent choice for concealed carry, and it is equally in its element at the range.